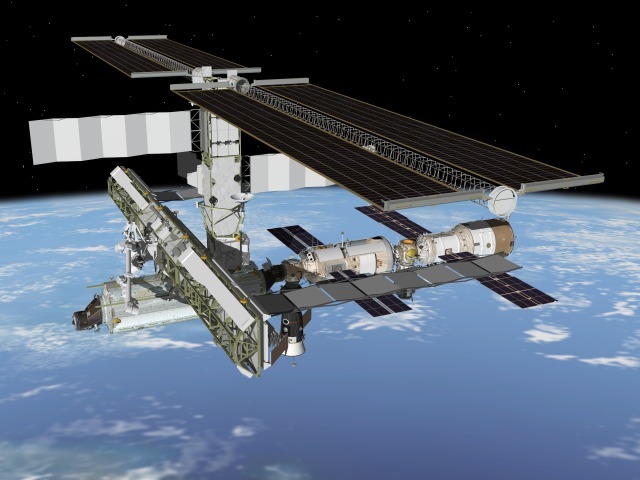 Following on from the success of the MIR Space station, construction began in 1998 of the International Space Station (ISS.) The Space Station is a truly international effort, comprising a partnership between the space agencies of the USA, Russia, Japan, Canada, and The European Space Agency. Expedition 1 crew took up residence on 2nd November 2000, and there has been a permanent presence ever since. Crew members carry out scientific experiments in the various labs and modules which make up the ISS, in areas such as biology, chemistry, physics and astronomy. It's not all hard work though! Click on the 'Play Video' link below to take a look at a short video showing a light hearted view of life in space. Make sure to have your speakers on! The Space Station orbits Earth at approximately 190 miles (350 kilometers) high, traveling at a speed of 17,210 miles per hour (27,700 km/h.) Being in a low orbit makes it possible to view the Space Station with the naked eye as it passes overhead. With satellite tracking software passes can be predicted. Details of pass schedules for the Chepstow area, along with information on tracking software, can be found on my ISS Visibility page from the menu link on the left. In addition to talking with Hams, the crew also make pre arranged contacts with schools and colleges around the world. Students then get the opportunity to speak directly to the astronauts, asking prepared questions via a Ham Radio link. The radio equipment and links are set up by ARISS volunteer teams. Amateur radio equipment on board the ISS currently comprises 2 meter and 70 centimeter band transceivers which are located in the crew living quarters. Voice downlink transmissions can be heard on 145.800 Mhz. All images on this page are courtesy of NASA.